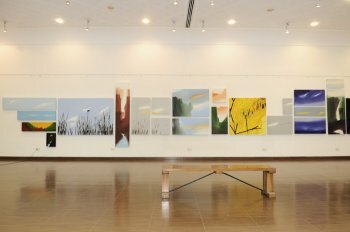 Mindscape by Sandeep Bomble is the record of an artist’s journey across panoramas of oceans, plains, forests and mountains under the sky. 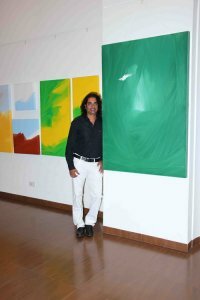 Exhibited in the Nehru Centre Art Gallery, Mumbai (5th to 11th Feb, 2013), it is the 6th one in the series. The display had a magnetic pull from beyond the glass panels, beckoning my inner spirit. Caught within the whirlpool of colours my mind succumbed to its lure. On entering the auditorium, I gazed at those magic casements opening on to the vistas beyond. Frame after frame danced to an inner tune and the abstracts bloomed into shapes as my mind conjured up the realm of beauty. It is the aesthetics of colours that primarily keeps you drawn towards the large paintings that are abstract in form. Yet, they are so evocative that your mind coalesces with the mindscape of the artist and you journey on a parallel plain. Of course the painting of Ganesh, however abstract, sets the tone of spirituality to an Indian mind. 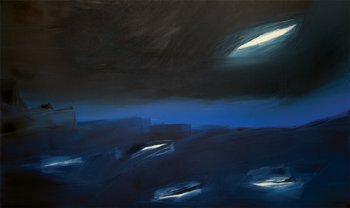 To me, the two paintings close by in shades of blue with white splashes evoke the day time sky with white clouds floating, inducing a sense of calm in the mind. The next canvas, an amalgamation of dark-brown and deep-green against flaming yellow brings you down to mother Earth in summer hues. In the next small painting you glimpse the blue of flowing waters beyond dark shapes that suggest a rocky terrain. And you reach the watery expanse with the ‘Skyscraper’ and other studies in different shades: the waters of the land skirted by willowing plants reflect the cloudscape. The mind gets attuned to the mood that the paintings create. Beyond the watery expanse, like a child, you reach a fantasy land of golden, ‘Bamboo Field,’ wondering whether autumn resides here. All the sunlit landscapes brighten your depressed mind taking you far from the dull routine. 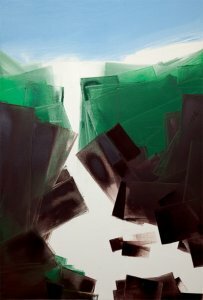 ‘On High’ introduces a different perspective, as though the mind zooms from the clouds to meditate on the waters down below, sheltered by the landmass in green. Your mind embarks on a journey now, spiritual in a deeper sense. The Indian mind since time immemorial has seen the divine in the heart of nature. The pilgrims in the subcontinent have navigated the land to reach the upper Himalayas, while people from other continents explored the sea to reach other lands. Even today, travellers moulded by science, and those who are atheists in temperament, bow in reverence at the holy shrines carved by beauty. And he/she moves up in life, a pilgrim. And pantheism has been the undercurrents of Indian aesthetics, symbolised in myths and legends from ancient times. Legends have etched the Moon as a goddess. Here, the artist paints dark night that filters the charm of the moon in a mystique aura. The nightscapes on canvas remain engraved in the mindscape of an onlooker. The seashore has been a haven for humans for joy, love and peace. And waterfall is another mesmerising feature under the sky. The artist captures its hypnotism that fascinates every mind. The perennial waters fall and flow in all majesty... you read the words... “to be continued”.... the spell is broken. There at the end, sat the creator of an enchanting space. Pantheistic in philosophy his abstract paintings are rhapsodies that serenade a holy love, felt along the heart, perceived by a purer mind, at the portals of Nature. And the aesthetics of the artist attracts and endears itself to a cumulative feeling that resides in our racial memories. 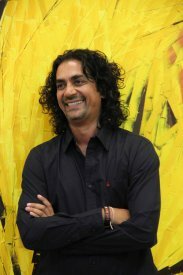 Sandeep Bomble loved to wield the brush and splash in colours as a child. Life’s cross roads had taken him for a while to the world of advertisement. Soon the inner promptings took him to a path less travelled. A lonely cloud, during one of his travels in Kodaikanal rained the manna of elegiac inspiration on him. And the artist emerged guided by the ‘Lost Cloud’ to a new horizon of abstract art. Even the painting technique resembles not brush strokes, but knife painting. His use of a piece of metal to paint is the signature of the artist. Perhaps his future series may carry rain drenched land or sea; transfer snowfall that makes the night white; bring down the many splendored ice clad peaks. And waiting is our lot ... until the Muse leads her artist.